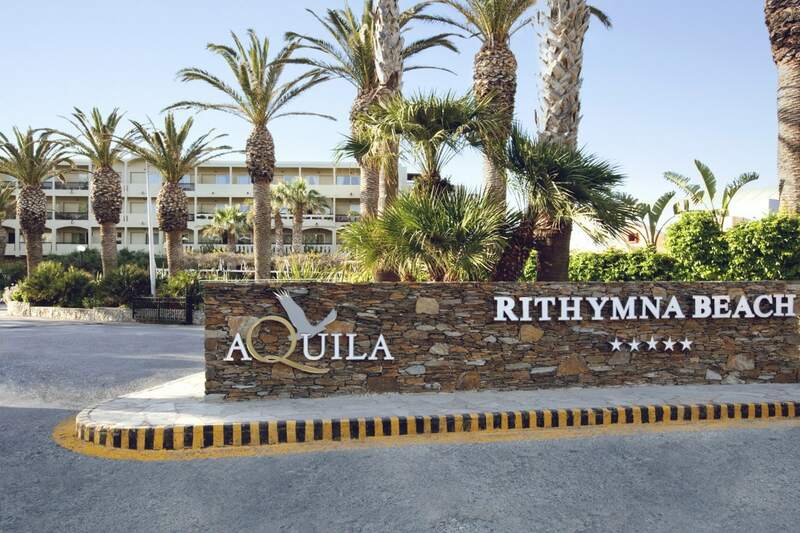 Aquila Rithymna Beach is well known for its classic aristocratic buildings and for offering its guests a friendly and personal service of the highest quality. One of the most beautifully planned hotels in Greece, situated on a 500 m long sandy beach, it is everyone’s ideal choice of a holiday resort hotel. The Cretan village style bungalows and traditional main building are set in 80.000m2 of gardens interspersed with colorful plants and shady old trees. The numerous pools offer another dimension to the swimming experience. 73 km east of the airport of Chania, 72 km west of the airport of Heraklion. Evening entertainment: Rethymno (7 km). A sandy, wide berry strip, 500 m long. Log into the sea: sand and pebble. Natural stone slab. Equipped with everything needed for a comfortable stay, sun loungers and towels for hotel guests are provided free of charge. Exclusive beach lounge and tents for an additional fee. Rithymna Main Restaurant: American Βreakfast from 7:15 to 10:00. Greek & International Delicacies Brunch from 10:00 to 10:30 and Dinner from 18:30 to 21:30. Our buffets are full of starters, salads, selections of the main course and desserts. Soups and drinks are waiter-served, as well as the main course, upon request. Guests on Full Board or guests on Half Board, who wish to have lunch instead of dinner, can have lunch from 12:30 to 14:30. 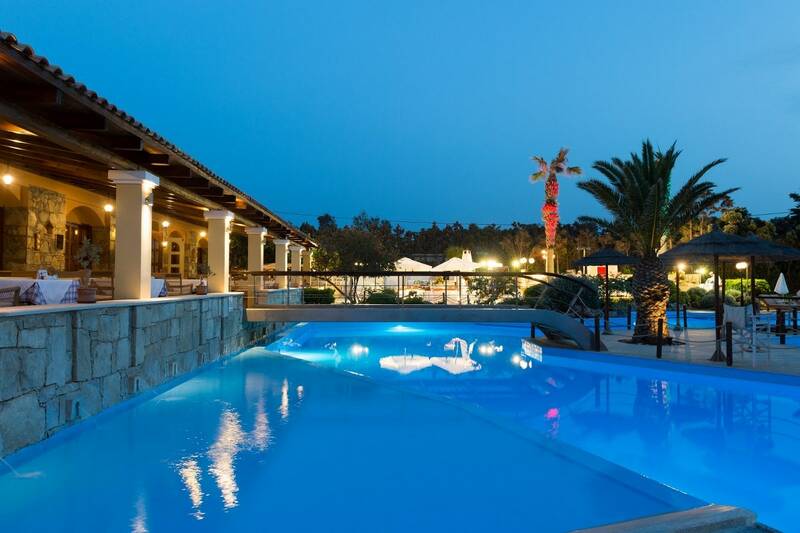 Taverna “Mournies”: Sit and dine under the mulberry trees overlooking the tropical pool. Enjoy: A La Carte lunch, Special themed evenings (Cretan Evening, Lobster Dinner, Fish Festival etc.). Live onstage entertainment. The bar of our Taverna serves fabulous drinks and cocktails. The “Rimondi” : The “Rimondi” Cafeteria/Brasserie is open until 18:00 for a refreshing drink or light meal. Ancient Eleftherna: Cretan & Greek specialties and exquisite recipes prepared with organic vegetables and produce. Oceana” Restaurant: Located next to the beach, “Oceana” offers in the evening fresh seafood (fish and lobster). Loggia Lounge Bar: Michalis and his team are always eager to prepare tropical cocktails and drinks, as well as local beverages. Enjoy pre-dinner ouzo while you enjoy the evening on the veranda, overlooking the endless blue sea. “Great Hellas”: Typical Greek Kafeneion right in the center of the Cretan Village square where traditional Greek beverages and “mezes” are served. Beach Bar: Beach Bar. Εnjoy a refreshing drink or a cold beer at our beach bar, overlooking the picturesque blue sea. (Open until 18:00). Let yourself and your family enjoy a most pleasurable stay in our Family Rooms. 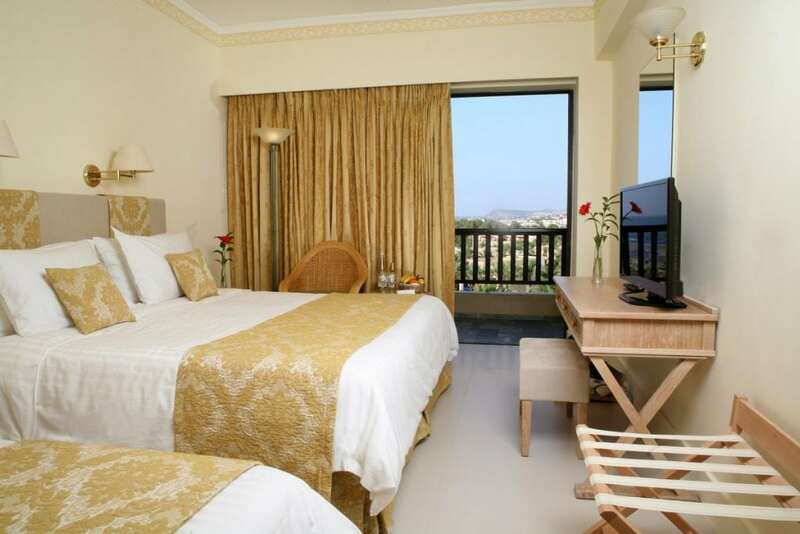 Our sea view rooms are exquisitely located directly on the beach front and overlook the outdoor pool. These family rooms are open plan style and for extra privacy there is a stained-glass sliding door separating the main bedroom from the bedroom/sitting area with the 2 sofa beds. Indulge in the seclusion of the luxurious waterfront Bungalow Suites and spread around in the relaxing balcony with the breathtaking view over the sea. Exquisitely furnished and decorated in silk teffeta in shades of royal gold with floors covered in thick carpet, our spacious Deluxe Bungalows feature a spacious lounge with a dining corner, bedroom and a marble bathroom with exclusive cosmetics. Indulge in the seclusion of the luxurious waterfront Two Bedroom Bungalow Suites and spoil yourself among the spacious lounge, study and dining area, the two separate bedrooms (one with double bed and the other with two single beds) and two marble bathrooms with exclusive cosmetics and telephone. 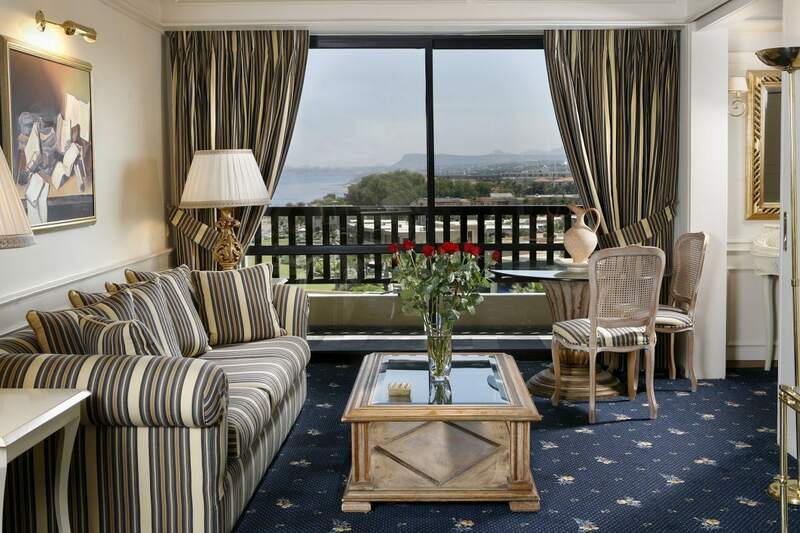 Exquisitely furnished and decorated in silk teffeta, shades of royal gold and floors dressed with thick carpet. From the large terrace with its wooden deck chairs and soft cushions, with the comfortable open-air lounge area under the pergola, guests can appreciate the breathtaking view over the sea and will discover and enjoy the picturesque landscape. 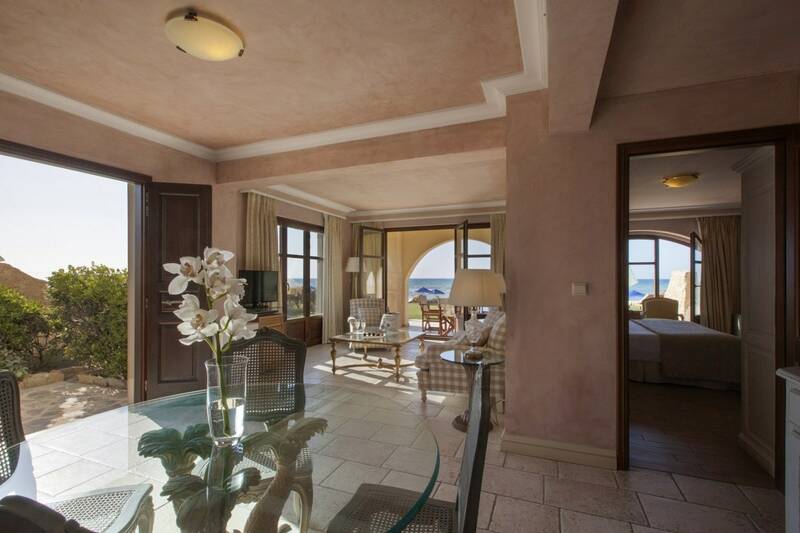 These luxurious suites welcome you into an authentic Cretan Village style. They all stretch out directly on the beach and the Mediterranean style gardens in front of them create an unparalleled tranquility. The open plan style rooms with living room and bedroom area feature wooden and wrought iron furniture and marble bathrooms with exclusive cosmetics. They open onto a terrace with romantic furniture and deck chairs with soft cushions. A jewel in combining traditional Cretan style villas with local architectural elements, our Deluxe Junior Villa is just a few steps away from the sea. The gardens are surrounded by high stone walls, offering unparalleled privacy and relaxation to its guest. Like all villas, it features a small pool, an outdoor lounge with exotic vegetation and deck chairs with soft cushions. Indoors, we find an intimate lounge with a dining corner, a marble bathroom with exclusive cosmetics and the bedroom, which is decorated with delicate fabrics for your romantic summer nights. 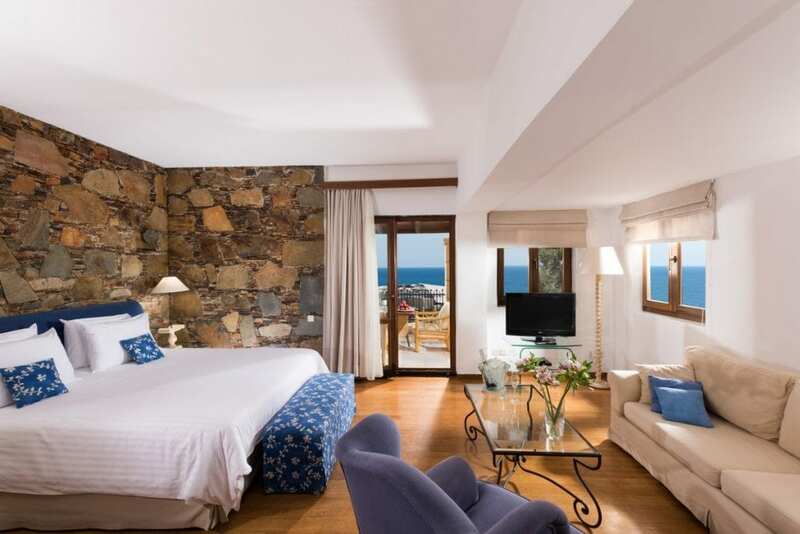 Inspired by traditional Cretan style, we have decorated our maisonettes with ultramarine and cream-colored delicate fabrics in order to fully immerse you into the Cretan feeling. The ground floor apartment features: large sofas which can be easily converted into childrens’ beds, a bathroom with exclusive cosmetics, a terrace which is surrounded by the tranquil gardens, a private balcony with an unparalleled view of the garden and a dining corner and deck chairs with soft cushions. And all this, just a few steps from the sea. A jewel in combining traditional Cretan style villas with local architectural elements, our Dream Villa is just that: a dream located just a few steps away from the sea. The gardens are surrounded by high stone walls, offering unparalleled privacy and relaxation to its guest. Like all villas, it features a small pool, an outdoor lounge with exotic vegetation and deck chairs with soft cushions.Indoors, we find an intimate lounge with a dining corner, two marble bathrooms with exclusive cosmetics and two bedrooms which are decorated with delicate fabrics for your romantic summer nights. A truly spectacular villa, located right in the center of the Hotel estate, is just a sight to behold. Being just a few steps away from the sea with its own private entrance and courtyard, the combination of a subtropical garden where a private pool brazens the atmosphere, an antique olive-press and the top-floor balcony view, will simply amaze you. Our Royal Pavilion however, is just as striking inside as well. The interior wooden staircase leads up to the master bedroom and the all-marble, sky lit bathroom, decorated with antique works of art. 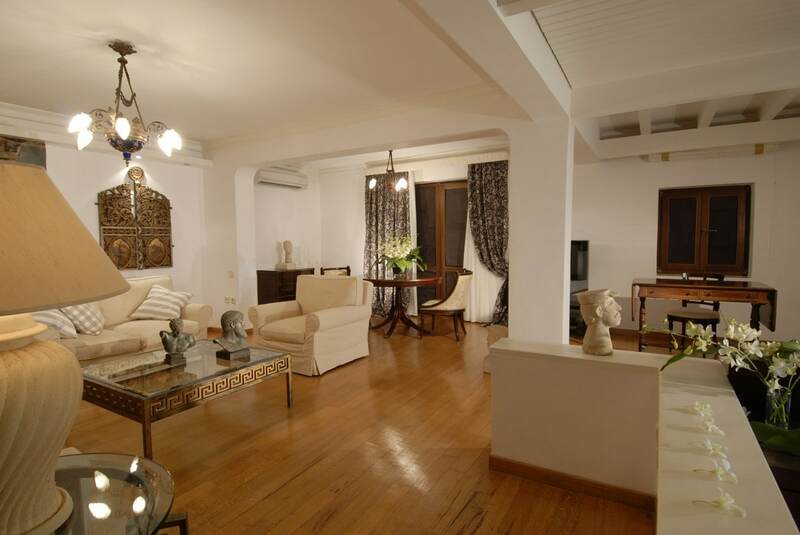 The ground floor is comprised of a large dining area & lounge, as well as a bar corner, a study and a second WC. The hall leads onto the first bedroom with its own marble bathroom with exclusive cosmetics and telephone.